WinBook is a company that is fairly well known in the notebook industry. Although not as big as Toshiba, IBM or Compaq, WinBook typically finds itself in, or just outside, the top 10 in the notebook sales category each year. WinBook notebooks are typically known for their design, performance, and value. The notebooks are mainly sold online but are also available through Micro Center stores. The current notebook product line includes three different notebook models. For the full desktop replacement/gaming notebook market, WinBook offers the J4 series Pentium 4 notebooks. The WinBook X series laptops target the thin and light segment of the market and come with Pentium III-M chips. Finally there is the N4 series notebook, one of which we had the opportunity to play with recently. The N4 series is targeted at the business segment and can be outfitted with the fastest Mobile Pentium 4-M chips available. Our test system, for example, came with a 1.8GHz Mobile Pentium 4-M chip; a Pentium 4-M chip clocked at a speed just announced today. As a desktop replacement notebook, the WinBook N4 has quite a bit of bulk to it. The casing of the system is entirely plastic, although beneath the plastic exterior lies a metal chassis. The color scheme is a traditional dark with the majority of the laptop coming black with gray accents. The gray accents are located both on the top of the notebook (on the rear of the LCD panel) as well as on the wrist rest. The system's buttons are also a dark gray. Opening the notebook reveals the N4's 85-key full size black keyboard that features a 19mm key pitch a 3mm key travel. The keyboard layout proved intuitive and the large key travel made for an enjoyable typing experience. Like other 85-key keyboards, the laptop includes dedicated arrow keys as well as home, page up, page down and end keys. The keyboard sits 5 inches from the front of the notebook, meaning that there is ample room to rest your wrist no matter how big your hands are. The touchpad pointing device sits slightly to the left of the center of the wrist space. The 0.75 inch offset compensates for the arrow and function keys on the right side of the keyboard. The offset allowed our thumb to rest comfortably on the touchpad when in the normal typing position. 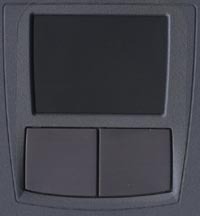 One unique feature of the N4's touchpad were its buttons, which were quite large. The buttons were about 1.25 inches by 1.25 inches each and we must admit that they took a while to get used to. After using the laptop for a while, however, we found the large buttons to be quite useful as we no longer had to search for the mouse buttons each time we wanted to click. Above the keyboard lies a power button and 4 function buttons. The first two function buttons are preprogrammed to open the default mail client and the default web browser. The second two buttons are user customizable. All four buttons can be set to provide audio CD playback in Windows, with the first button serving as the play/pause button, the second as the stop button, the third as the track back button and the fourth as the track forward button. To the right of the buttons are three green status LEDs that indicate the status of the caps lock, number lock and scroll lock keys. Also found on this top panel is a small hole to the left of the power button. Under here lies the system's built-in microphone. The system's 15" SXGA+ LCD was held strongly in place and opened and shut with ease. The front of the laptop includes three status LEDs as well as a cover for the system's hard drive. The green status LEDs indicated power state (on/off), hard drive access (access/no access), and battery status where flashing is charging and a steady light indicates full charge. The hard drive can also be removed via the front panel access cover. To remove the N4's hard drive, all one needs to do is unscrew a single screw on the bottom of the laptop and then pull down and out on the drive cover's lip. From there, the hard drive can easily be removed by pulling the drive out of the system. The front of the system is also home to the speaker ports which are located on both the left and right side of the system. Unlike what we experienced with the ASUS T9 notebook, audio output was not blocked by our wrists in the N4. This is due to the N4's overly abundant wrist rest space as our arms fell comfortably above the speakers and did not block output.